Want to claim the title for best burgers in the neighborhood? This is the way to one-up your friends down the block who brag about their grilled hamburgers. Smoking makes ground meat taste like tenderloin. 1. 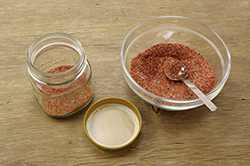 An hour or two before you plan to barbecue, combine the rub ingredients in a small bowl. 2. 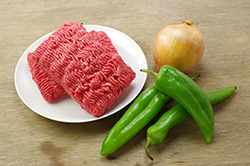 In another bowl, mix the ground beef, onion, and chiles with your hand. 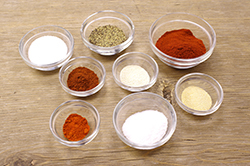 Form the mixture into 4 thick patties and apply the dry rub thoroughly to all surfaces, reserving 1-1/2 teaspoons of the spice mixture if you’re planning to baste. 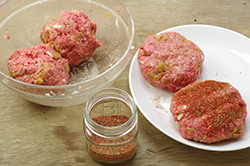 Cover the patties with plastic and refrigerate them. 3. Prepare the smoker for barbecuing, bringing the temperature to 200°F to 220°F. 4. 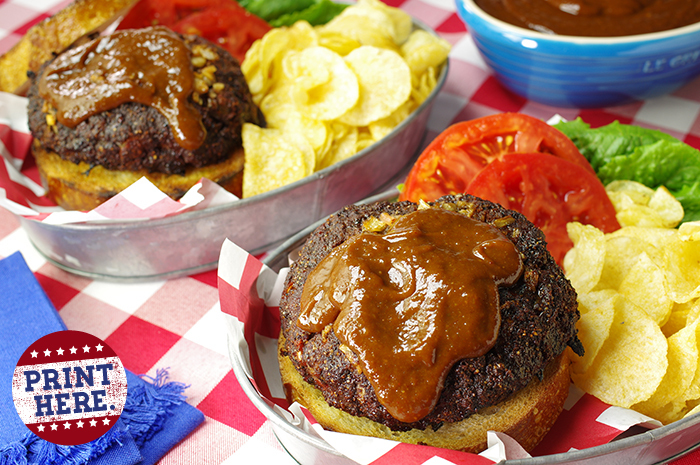 Remove the patties from the refrigerator and let them sit at room temperature for 15 minutes. 5. 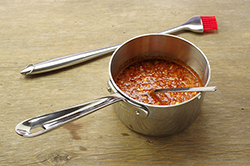 If you plan to baste the meat, stir the mop ingredients together with the reserved 1-1/2 teaspoons rub in a small sauce pan and warm over low heat. 6. 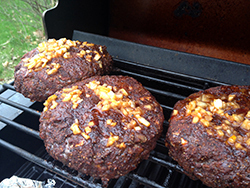 Transfer the patties to the smoker and cook until done to at least medium, about 1 hour, mopping every 20 minutes in a wood-burning pit, or as appropriate for your style of smoker. 7. Serve the burgers between slices of sourdough bread. Try a bite before you reach for any of the optional toppings, all good but less than essential with the richly flavored meat. BBQ TIP: For the best ground beef for barbecuing, ask your butcher to twice grind a piece of chuck, top or bottom round, or rump, with enough fat to make up about 20 percent of the whole. BBQ TIP: Some of our recipes call for fresh green chiles, such as New Mexican or Anaheim, which must be roasted first to blister the tough skin. You can roast them individually over a gas stove burner, the same way you toast marshmallows over a fire. Spear the chiles on a fork, place them near the flame, and heat them until the skins have blistered and darkened uniformly. If you’re roasting several chiles, you might want to do it in an oven. Place a layer of pods on a baking sheet and broil them until all are dark, turning the chiles frequently. After roasting, place the hot chiles in a plastic bag to steam and cool. Peel the roasted pods if you want to use them immediately, or freeze them, which makes the peeling easier. Canned chiles make a poor substitute for a home-prepared version, whether you start with fresh or frozen. 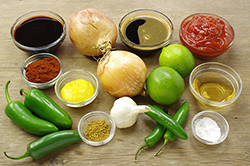 A lot of Texans eat their barbecue without a sauce, or with just meat juices laced with cayenne, but others prefer a robust sauce full of Southwestern seasonings. 1. 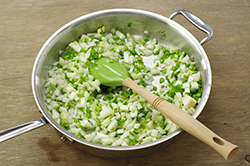 In a saucepan, warm the oil over medium heat. Add the onions, jalapeños, serranos, and garlic and sauté over medium heat until everything is softened. 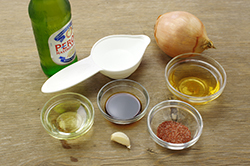 Mix in the remaining ingredients and bring the sauce to a simmer. Cover and cook for 35 to 40 minutes. Allow the sauce to cool briefly. 2. 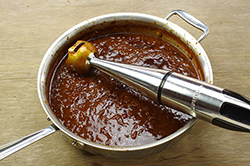 Strain the sauce and puree the solids in a food processor. Return the pureed mixture to the sauce, stirring thoroughly. 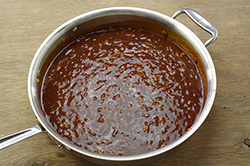 Refrigerate the sauce overnight to allow the flavors to mingle and mellow. Use the sauce warm or chilled. It keeps for weeks. 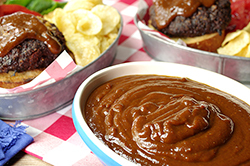 SERVING SUGGESTION: If you don’t want to slop up your ‘Q,’ use the sauce on potatoes. It makes a good topping on baked spuds, along with other favorite condiments, or stir the sauce into cottage fries or hash browns while they cook to give the potatoes an outdoorsy ranch flavor.